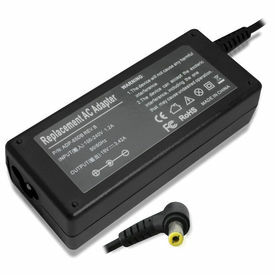 Buy CL Laptop Adapter 19V 3.42A, 5.5mm* 2.5mm - for Acer Aspire One A110L online - Clublaptop - The largest online store by Manufacturer of Laptop Accessories and Spares. This Clublaptop P-Power replacement adapter is designed to provide reliable power and charge to your laptop. Made from highest quality parts each CL replacement adapter conforms to specifications similar to original in its appearance, size and quality. Each CL replacement adapter comes with high quality power cord to ensure proper power supply to your laptop. Each adapter also passes necessary authentication certifications like CE, ROHS etc. before leaving the factory, so you can be rest assured for its quality, durability and performance.